This metal material is defined as a ferrous alloy with a minimum of 10.5% chromium content. The name originates from the fact that stainless steel does not stain, corrode or rust as easily as ordinary steel. Special Property: This metal is also referred to as corrosion resistant. Stainless steels have higher resistance to oxidation (rust) and corrosion in many natural and man made environments. Metal Appearance: Stainless steel's resistance to corrosion and staining, low maintenance and familiar luster make it an ideal base material for a host of commercial and residential metal applications. Metal Cost: Stainless steels will be more expensive than standard steel but does not require painting or treating after production. This metal is found primarily in bauxite ore and is remarkable for its resistance to corrosion (due to the phenomenon of passivation) and its light weight. The metal is used in many industries to manufacture a large variety of products. Metal Appearance: Aluminum is a soft, lightweight metal with normally a dull silvery appearance caused by a thin layer of oxidation that forms quickly when the metal is exposed to air. Aluminum is nontoxic (as a metal), nonmagnetic, and nonsparking. Aluminum is about one-third as dense as steel or copper; it is malleable, ductile, and easily machined and cast. It has excellent corrosion resistance and durability because of the protective oxide layer. Special Property: Improper use of aluminum may result in problems, particularly in contrast to iron or steel, which appear "better behaved" to the intuitive designer, mechanic, or technician. The reduction by two thirds of the weight of an aluminum part compared to a similarly sized iron or steel part seems enormously attractive, but it must be noted that this replacement is accompanied by a reduction by two thirds in the stiffness of the part. Therefore, although direct replacement of an iron or steel part with a duplicate made from aluminum may still give acceptable strength to withstand peak loads, the increased flexibility will cause three times more deflection in the part. Metal Cost: Aluminum will be more expensive than standard steels and approximately the same cost as stainless steel. This metal is an alloy primarily composed of iron, with carbon content between .02% and 1.7%, depending on grade. Carbon is the most cost effective alloying element for iron. 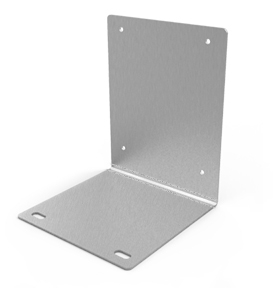 Special Property: Commercial grades of steel used in the production of brackets and fabrications are typically supplied in sheets with thicknesses described as gauges. Typical gauges would be 12 (.10”), 14 (.075”), 16 (.060”), 20 (.035”)gauge. 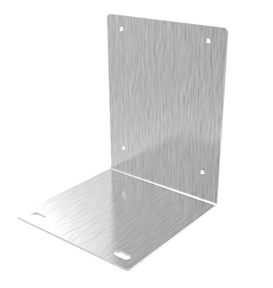 Plate steel would be described in thickness of 3/16 (7 ga), ¼” ,3/8” and ½”. Metal Appearance: Light gauge sheet steel (12 gauge to 20 gauge) would normally be cold rolled and have a smooth, clean surface. Heavy gauge steels (3/16” to ½”) are typically hot rolled. The surface is rougher than cold rolled but still acceptable for most applications.